Does your mouth or throat itch when you eat certain foods? Do your lips swell a little bit and get itchy as well? Or maybe your face, chin and neck itches in a unique way that you can’t explain? This is an allergic reaction called oral allergy syndrome (OAS) and it affects millions of people during the allergy seasons. What actually causes this is a cross-reaction between the seasonal pollen you are allergic to and the protein in certain foods that you eat. You can better identify the root cause of the problem with an oral allergy syndrome chart. This unique allergy is caused by an overreaction of the skin and mucus membranes caused by exposure to specific proteins in foods, mostly raw fruits and vegetables. When you are allergic to the seasons, you are actually allergic to the protein in the pollen. When your body’s mucus membranes in your nose and eyes collect this pollen protein, the immune system sees it as something that is hard to get rid of, digest, or excrete and identifies it as a possible invader. This causes your immune system to activate allergy chemicals like histamine to target the source of the exposure. If the pollen is in your eyes, they will get puffy, watery or itchy in an attempt to get you to naturally get rid of the pollen physically. However, this doesn’t usually work too efficiently if you didn’t realize already. In the case of oral allergy syndrome, your mouth and throat are exposed to a protein that you are allergic to. When you eat the foods that you react to, the protein in the food irritates your mucus membranes, which causes an allergic response. All of this is evidence that nature and evolution is imperfect. Oral allergy syndrome annoys the heck out of me and it has for as long as I can remember. As far as I have researched, everybody’s oral allergy syndrome is different and can vary in severity. If you are wondering if you have this syndrome, maybe my story can relate to you. Ever since I was a child, I would eat certain raw fruits and vegetables, including melons, bananas, carrots, celery, broccoli, potatoes and oranges uncomfortably. I would eat them and then my chin and neck would have a strange scratchiness that could never be satiated. After minutes of scratching, the area of my skin would become red and splotchy and develop a slight stickiness. On top of that, whenever I got the juices of these fruits on my hands, they would make the skin of my hands react in the same way. But I didn’t just react this way to raw fruits and vegetables. In fact, raw eggs, soybeans, cilantro, and nuts would make my oral allergy syndrome flare up as well. I had noticed that my body would only react to specific foods during specific times of the year. For instance, my face would only itch when I ate a banana during the fall, almonds during the spring. It was so perplexing until I found out what oral allergy syndrome really is. I then learned new ways to treat this allergy and they were so simple and effective that oral allergy syndrome does not bother me anymore. The first step to treating and curing this syndrome is by analyzing an oral allergy syndrome chart that cross-references seasonal allergies to the proteins in specific foods. 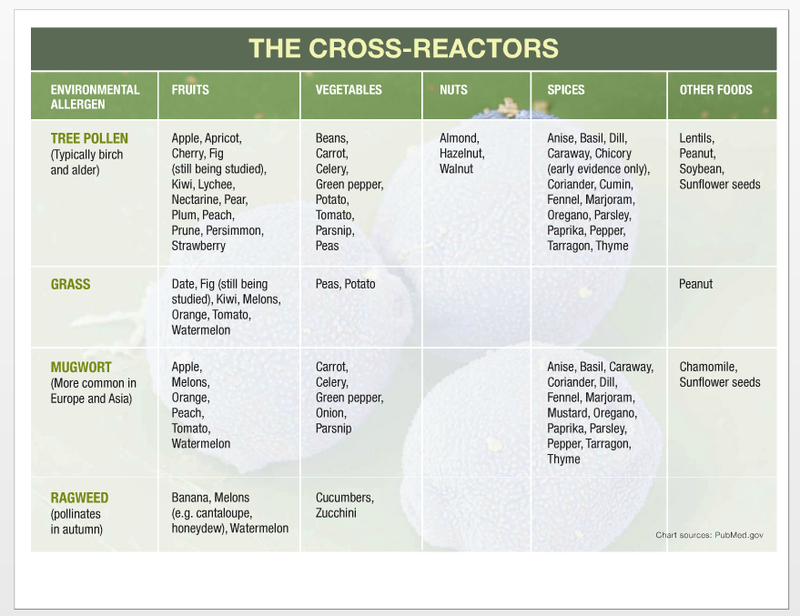 Here is a very useful oral allergy syndrome chart that compounds all of the foods and seasonal allergies that can cross-react. Some websites will vary in their degree of foods for each pollen and some of them are incorrect with no scientific backing. I tried to collect the most accurate and common foods for each pollen season. Of course, there are some unique and rare foods, like raw eggs in my case, that triggers oral allergy syndrome. Perhaps this is due to another hidden allergy that I have, like latex, reacting with the protein in eggs. Therefore, it is impossible to make a complete oral allergy syndrome chart because some people are unique and their immune systems will react differently. Contact with chemicals may produce the same symptoms of oral allergy syndrome. I have provided a full, detailed oral allergy syndrome foods list here. Scratchiness, redness or swelling on the hands if the juice of the food gets on your skin. Stickiness forming after scratching infected area. There is a multitude of factors that can contribute to the severity of oral allergy syndrome. From my personal experience, I can say that my oral allergy syndrome has been healed into practically being non-existent. But at times when I make bad decisions for my lifestyle, I can notice that the syndrome gets worse. If your body reacts this way to raw fruits and vegetables, this is a sign that your body is not in a healthy state due to whatever reason. Oral allergy syndrome is a sign that your immune system is over-reactive and needs rebalancing. Doesn’t it seem kind of crazy that your body is rejecting fresh fruits and vegetables? Thankfully, this allergy like many others can be healed completely and I can say that from experience. Most people will not consider that allergies can be treated or cured, but they definitely can with a good amount of effort and understanding of your own body and why it is reacting that way. You must focus on a few things in your lifestyle so that you can restore your immune system to its proper condition so that you will be able to eat the fresh, raw and nutritious foods that your body rejects. It would be such a shame to have all of these nutritious foods fight against your body. This is the easiest way to prevent an oral allergy reaction to a specific food. Cooking or heating will “denature” the protein that causes cross-reactivity with pollen. Therefore, cooked foods are less likely to be allergic foods. Raw carrots used to be a huge trigger for my oral allergy syndrome. However, when I cooked the carrots in boiling water for a few minutes, the cooked carrots would not make my face scratchy at all. I could eat them just fine. The majority of your immune system is comprised in your gut. You can significantly reduce the load on your immune system by avoiding foods that harm your gut, like simple carbohydrates and salt. Incorporating a high-quality probiotic with prebiotic foods is important because they help digest and produce the things you need to maintain a healthy internal environment. These beneficial organisms boost the immune system in many ways. Make sure that you invest in a probiotic supplement that has a wide variety of different strains and a high colony-forming unit (CFU) amount in each serving. More than 10 different strains and at least a billion CFU is recommended. Also make sure that the capsule is stomach-resistant because many probiotic supplements are ineffective because the encapsulated bacteria get killed by stomach acid that leaks in. A great example of a high-quality probiotic that is world famous for its health benefits is Hyperbiotics Time-Release Probiotic Pearls. The reviews on this probiotic are fantastic, with some allergy-sufferers claiming that it cured their food intolerances and seasonal allergies. Eating a healthy diet full of fiber and fresh produce will partner well with this regimen. This is an important one. Alcohol has little to no health benefits that outweigh the damage done to your immune system. It depletes the body of many essential nutrients and puts stress on your detoxification systems. Even in moderation, alcohol is harmful to your health in many ways and can easily be classified as a hard drug. When I do not drink for a few weeks, I notice that my oral allergy syndrome symptoms disappeared pretty much completely. But when I drink even a few sips from a drink now, the scratchiness immediately returns. Perhaps this has something to do with alcohol being antibacterial, easily killing beneficial probiotic bacteria that assist your immune health. Avoiding alcohol would definitely be my best advice for treating and curing oral allergy syndrome. In the event of an allergic reactions, it is important to stay hydrated because the release of histamine in your body is very dehydrating. Adequate pure water and foods that contain electrolytes will be very healthy for you. Coconut water and bananas are very hydrating if you are not allergic to them. Increased stress can raise cortisol levels in your brain, which promotes inflammation and more stress. This can further exacerbate oral allergy reactions and make it much harder to treat them. Meditation, yoga, and a nice warm bath will always help me after a long day. We are not ignorant of the beneficial uses for antihistamines. Whether natural supplements or OTC drugs help you more, it is up to you because it is better to not have histamine in your body. It’s important to not rely on antihistamines because you can start developing an addiction to them. On my severe allergy days, I prefer the OTC drug Allegra. It noticeably works more effectively for me than all of the others. You can get it for much cheaper than local stores on Amazon. Non-addictive natural antihistamines include quercetin and ginseng. These are very healthy supplements that can improve your health in a variety of other ways as well. Refined simple sugars, trans-fats, unclean tap water, baked desserts, fried or processed food, and drugs constantly put stress on your digestive and immune system. It would be beneficial to remove these things as best you can from your diet because they can raise the oxidation of your blood. Incorporating a diet with adequate amounts of antioxidants can help you with this. Resveratrol and quercetin is found in onions, apples, olives, grapes, and berries. They have important natural phytonutrients that can relieve allergy symptoms. I cannot recommend matcha green tea enough as a powerful antioxidant with such a beautiful range of health benefits that can work great as a coffee alternative. You should also keep in mind that avoiding allergic foods is important because they cause inflammation. I am always here for you. So if you have a question or something to add to this oral allergy syndrome chart, please leave me a comment below! did I miss that on your charges? What do you mean what about grains? As far as oral allergy syndrome, wheat is a known trigger. That may be true for all types of gluten grains, but it may depend on your own body. Tree pollen allergies are usually due to birch pollen. What did the test say exactly? Hi , I have a severe case of oas, I actually vomit when I have raw fruits and veggies. It’s the worst feeling not to be able to eat fruits and veggies in their raw form. I’ve suffered for this for 15 years now. I just want to all of this to go away. It’s hard to sustain a healthy diet when your options are very limited, especially eating on the go. I was thinking about going to see an allergists, and talking about immunotherapy. I heard the shots take about 3-4 years to work, if they even do. There’s not enough information on this, and I’m over being told to resort to canned foods and to cook everything. I was able to eat all kinds of fruit and veggies until about 8 years old, I did always have seasonal allergies, itchy eyes, scratchy throat etc ? But my questions are how did these oral allergies develop? People with OAS tend to see it change in severity through their life. This was the case for me. It’s a more volatile allergic-like condition. However, I’ve concluded that the severity of my OAS symptoms correlated with my immediate health. After I do parasite cleanses, it seems strange that my OAS symptoms disappear. That, and supplementing with MSM sulfur. I believe that my oral allergy syndrome developed as a baby because I was fed poorly. My immune system likely failed as I was given poor quality formula and unfiltered tap water. Just my speculation for now. Let me know what you think. Wow, that seems like a severe case of Oral Allergy Syndrome. I did not know that some people vomit from this condition. Have you tried the methods that I recommend that have worked for me? My 40 year old son has the worst case of OAS I’ve ever heard of. He gets very sick to the point of throwing up when he eats any fresh produce. His food must be cooked to mush for him to not react. He has never been diagnosed and it was always a mystery but with research I found the information about OAS and immediately knew this was him! Are there any ongoing research institutes doing treatment testing? He would be a great candidate. If he eats fresh fruit or veggies, he gets a scratchy feeling in the back of his throat and it will quickly progress to stomach cramps until he throws up . He seems to think eggs sometimes cause mild symptoms but his father was touchy with eggs as well. It is awful that he cant eat any fresh fruit or vegetables. I wish there was help for him. Please let me know if there is anything new or treatment trials. That sounds exactly like what I had. Does he eat a lot of meat, sushi, raw fish or unwashed produce? The symptoms you have described seem to correlate with that of a parasite infection. It did for me. I did a parasite cleanse and my symptoms of oral allergy syndrome disappeared. Let me know what you think! I have much information written on parasites. My 7-year-old little boy has been dealing with this since he was just 2 or 3. His reaction to most raw fruits and veggies is that he develops itching on his head right above his ears. It’s almost immediately following a bit of raw fruits and veggies, and also honey. I want to help him so badly because he can’t eat so many things that are good for him. Even cooking some things doesn’t seem to help. Every time he has cooked tomatoes or potatoes, celery, and several others, he still reacts. I am starting him on a good probiotic, but changing his diet is so difficult, because the things that are good for him are things he can’t eat. It’s also incredibly hard to eliminate the triggers because it is so sporadic. Sometimes he can eat an apple and be ok. Other times he takes one bite and hands it back to me. Same with all fruits and veggies. It’s so frustrating and I want to badly to heal him without the use of drugs. Any advice is greatly appreciated! This doesn’t sound like oral allergy syndrome to me. Perhaps it is something else related to seasonal allergies or another environmental sensitivity. I was in the same boat earlier in my life because I was worried that I couldn’t eat healthy enough. I was allergic to almost everything! But my methods of fasting, parasite cleanse, and sulfur supplements helped to heal my healthy food allergies and OAS. To help your little boy, I would consider parasite infection, Candida overgrowth and sulfur deficiency and also invest in his health by visiting an immunologist. They can give you a personalized test so that you can see what exactly he is allergic to. Then, he can make a professional recommendation for you. Please let me know what you think! My 15 year old son developed OAS about 5 years ago. He loves fruit and is struggling daily with this. Four years of allergy shots to help with grass,pollen,trees,etc,.not much better. Daily RX helps to certain degree,but itching so bad if he eats fruit, he rubs an ulcer on end of tongue. Sometimes this lasts weeks. Any vitamin or special probiotic you might suggest ? He really misses fresh fruit. It makes me sad to think of entire life without fresh fruit. Have you tried a probiotic with or without lactobacillus? Also, does sulfur supplementation work for you? I have the birch pollen version of OAS. Your chart lists potato and wheat as well as a number of herbs and spices such as coriander and parsley. Does that mean I have to avoid them even in their cooked state? I’m trying to build up a list of all the items to avoid to get myself to the state of no symptoms. Not succeeded yet. I’m living on rice and really missing crisps ( or chips ) as you call the in the US. No, that does not mean that you have to avoid spices, wheat, or potato in their cooked state if you have oral allergy syndrome. I have discussed in this article that cooking the offending foods often solves the problem naturally. However, everybody is different and you still may experience symptoms even if you cook it. You’ll have to find out yourself and let yourself know. But generally, this is the consensus. For me, cooking works and I can eat any food that triggers my oral allergy syndrome symptoms. Also, your diet seems scary and not balanced at all. I’d consider incorporating some fresh raw foods as well. Let me know what you think! Thanks for directing me here from Instagram. You’ve definitely echoed my thoughts on OAS. Another thing to add is that I am HIGHLY allergic to peanuts but can eat food cooked in peanut oil. I’m amazed. Same concept to cooking the offending food before eating it I guess…. but I have never been able to eat peanut butter or a peanut, roasted or not! Wow that’s very interesting. It doesn’t seem like peanuts are a huge trigger for oral allergy syndrome sufferers. It’s especially strange that you are very allergic to peanuts and cooking eliminates the allergic reactions. Could you please give me some more information on your peanut allergy/intolerance? I have horrible reactions to raw apples and bananas. Using this oral allergy syndrome chart, I can definitely confirm that I have fall allergies. it’s weird how I don’t experience a reaction when the food is cooked. Thanks! That kind of sounds like me, except I get reactions to apples in Fall and Spring for some reason. 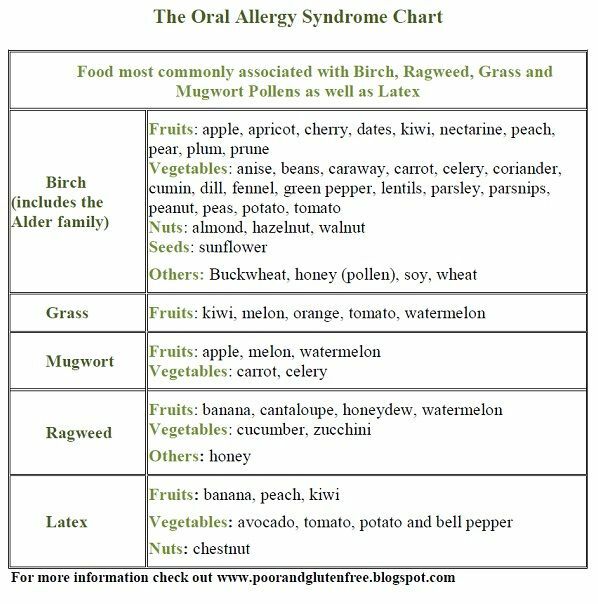 I’m sure there are exceptions to this oral allergy syndrome chart, but the most common ones are definitely helpful. Thanks for the input!